Art month is in full swing in HK, with a whole host of creative concoctions on offer at various different hotspots across the city. 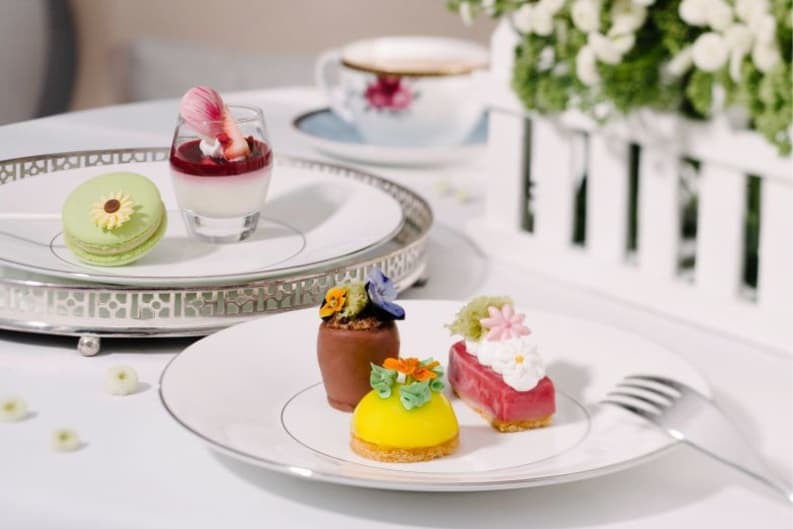 The Langham, Hong Kong has wholeheartedly embraced the creative flow and launched their delightfully fun and frivolous Blooming Afternoon Tea menu. You may think you've seen it all when it comes to traditional afternoon tea sets, but The Langham has managed to reinvent the concept with the introduction of decadent designs and colourful textures to the pretty plates on offer. Palm Court Lobby Lounge is the perfect setting for this whimsical experience and complements the classic yet luxuriously indulgent nature of the Blooming Afternoon Tea experience. As a live harpist strums in the background, the ambience is ethereal and transports guests a million miles away from the hustle and bustle of TST just outside. The delicate dishes are – as expected – completely stunning and have all been conceptualised by Executive Pastry Chef Matthieu Godard. Chef Godard and his team have created a selection of five exquisite pastries designed as bouquet of blossoms with an abundance of flavours such as pistachio and white chocolate, strawberry and rose and classic chocolate. Savoury accompaniments include the 'pseudo' tomato patch with fillings of smoked salmon and cream cheese, chicken with Dijon mustard and green tea hummus with sesame paste. The Langham also goes the extra mile with the addition of quirky touches such as the bespoke Garden Globe cocktail and an on-site illustrator to draw guests' portraits. The cocktail is a masterpiece in itself and a refreshing change from the usual glass of bubbles. Sheltered within an ice sphere, this creative concoction is made with elderflower, violet flower and blackcurrant liqueur, as well as fresh lime juice and egg white. This can be leisurely sipped while artist Tanya Bennet sketches a personalised portrait, ready to take home as a keepsake of a very memorable afternoon.